Apple should consider launching its products earlier in China, and expand its online distribution there, if it wants to avoid future displays of customer dissatisfaction like Friday's egg throwing at a Beijing company store, according to analysts. On Friday, Apple launched the iPhone 4S in China, three months after the product first went on sale in the U.S. But things turned ugly at one of the Apple stores in Beijing when an irate customer threw eggs at the store's exterior after the people in line had been told Apple was canceling the shop's iPhone 4S sales. Police then arrived at the store to clear out the customers, some of whom had waited in the freezing cold throughout the night to buy the product. Following the incident, Apple said it will suspend its iPhone 4S sales at its five retails stores located in Beijing and Shanghai. The smartphone, however, is still on sale through the company's online store and authorized retailers, such as China Unicom, the country's official carrier of the Apple iPhone. It has also been spotted on the gray market for several months. Over the past few years, Apple has worked to expand its retail distribution in China to also include mainstream retailers in the country, said Nicole Peng, a research director with analyst firm Canalys. But many customers are still unaware of this, and believe they have to buy the company's latest products from its official stores. "They can get the device from other outlets, rather than go to the main Apple store," she said. "What surprised me was many people didn't get the message." 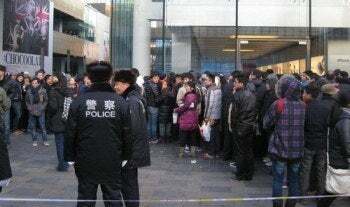 On Friday morning, Apple's store in Beijing's Sanlitun district had more than 400 customers waiting to buy the iPhone 4S. Other Apple stores in China also had massive crowds waiting to buy the device, with Apple reporting selling out of the smartphone. Educating Chinese consumers on Apple's other retail channels could help reduce the crowds at company stores, Peng said. But Apple could do even more by also releasing its latest devices at the same time as it does for it's U.S. product launches, she added. 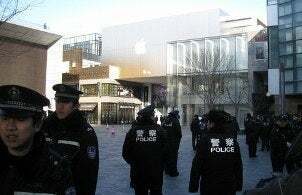 Police quarantine the area around the Apple store in Beijing's Sanlitun area following eggs being thrown at the store's exterior wall. "(Chinese consumers) want to have the gadget as soon as possible, they don't want to wait," she said. "If Apple launches the products earlier, consumers don't need to feel like, "I'm already late, I need to get it quicker." "The reality of the market is that there is a limited supply of product. Apple might want to consider another sales approach," he said. "Hopefully this incident will be a learning experience for them."